Every wonder what all the different shape knives are for? I know I did. So I walk around the corner to ask questions at my local fancy, high-end Laguiole knife store (because I live on Ile St. Louis, so of course I have a local fancy, high-end Laguiole knife store). 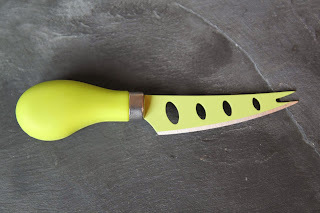 Counter intuitively -- a sharp knife with holes in it is actually for soft cheeses/ But not too soft: something with a little rubbery spring to it, like a Brie or Camembert or a slightly firm goat cheese. The sharp, serrated edge and holes allow the knife to pass through soft cheeses with less sticking, making a cleaner cut. The little forked end is a bonus; it easily allows you to pick up the piece you've just sliced and serve it. 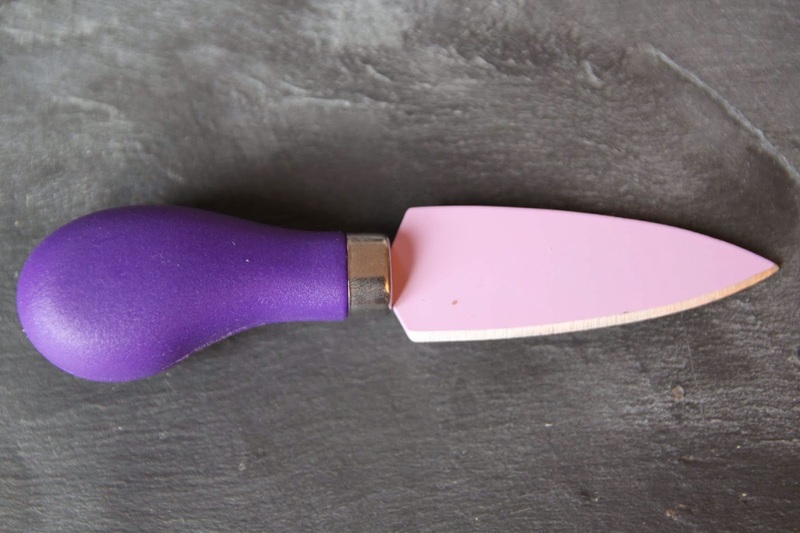 For harder cheeses, you use a strong, stubby knife that won't buckle, like the purple one below. Sometimes these knives are called cuore knives and are often described as heart-shaped. The shape is supposed to make it easy to chip off chunks of aged, extra-hard cheeses, like a Laguiole. This orange handled knife is a campana knife and is a roughly bell shaped knife with a wide-edged blade that cuts cleanly through blues. It also works well to chunk off firm or semi-soft cheeses. This one is, as it looks, basically a fork. It's not for cutting but rather for picking up chunks and slices. Of course, in a pinch, it can also help break up a hard cheese with the sharp points, or spread a soft cheese with the smooth edges. While my cheese knives are not world-famous Laguiole knives, my steak knives are. However, not all Laguiole knives have the same caché. They come in a wide range of prices, from about 20€ to over 500€ for a set of six. Those of you who know my bargain-loving ways will not be surprised to hear that my two sets come from the lower end of the price range. I still love them; they cut like a dream. But I suppose they are not made of hand-carved bone. The little bee is a hallmark (though not a requirement) of Laguiole knives, at any price point, but nobody's sure if it is, in fact, a bee. It comes from the first designs, in 1829, of the French Laguiole knives, by Jean-Pierre Calmels, based on knives that the Spanish (especially from Arab-influenced Andalucía) used and brought with them into Southern France, and that the French cattle herders and shepherds saw when they migrated down into Spain in the winters. Originally, Laguioles were cowboy jack-knives, and the insect there served a purpose, as a catch at the hinge. In French, it is called "la mouche" (the fly), as many people think it represents the sort of insect that would be hanging around the cows of the area, getting swished by their tails. Some do maintain it is a bee, however, an imperial symbol used when Napoleon granted them the rights. 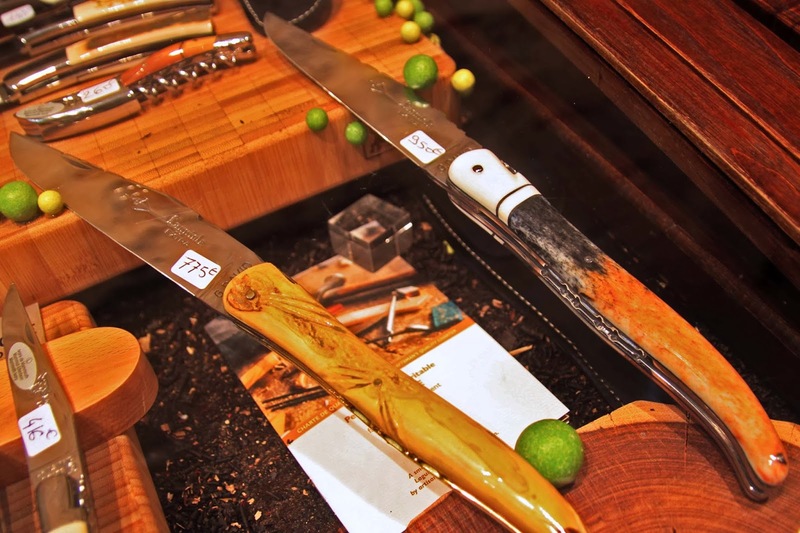 Today, in addition to a jack knife, a Laguiole can be a table knife, steak knife, cheese knife, butter knife, carving knife, or even corkscrew. Neither the name, the style, nor even the insect, is trademarked. So what seems like a brand name is, in fact, a generic name. You can see that my knives are Laguiole Jean Dubost, and it's only along with the specific manufacturer's name that it's trademarked and you can trace the provenance. The company that makes my steak knives has been around since 1920 as a family business in Viscomtat, France -- about 200km from the village of Laguiole but within the general "area" of Laguiole cheese and knife country. At my local store, which sells the ultra high-end Laguiole en Aubrac, a brand that's been around only since the 1980s, you can also buy a mammoth ivory jackknife for 450€, and a huge giraffe bone collector's jackknife for 950€. 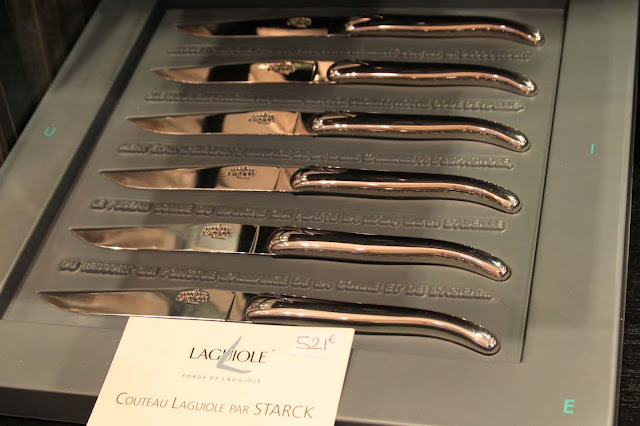 Not only does the brand hand-carve all the handles, they even hand-forge the blades. I pop a taste of Laguiole in my mouth in the store, and my eyes bug out. "That tastes like a cow farm!" Not a cow cheese, mind you. A farm. All of it: the grass, the hay, the manure, the sweat and methane gas coming from the cows. I swear, I can even taste the tractor driven by Jim-Bob in his overalls. Except that of course here it would be driven by Jean-Robert in his stylish scarf. Truly, it is the farmiest thing I have ever put in my mouth. Up until now, I did not even know that "farmy" was an adjective I would need to invent. This is not necessarily a bad thing. But it is a strong thing. I don't bother to buy a big chunk for the sheep-cheese/goat-cheese/strong-cheese/stinky-cheese-averse guests I have staying with me at the time. Laguiole, pronounced "la-yole", is an aged cheese -- at least four months (and, from the taste of this particular batch, up to four decades?!). It comes originally from the Aubrac region in central France, but since the late 1800s, production has been centered in the town of Laguiole in the same general area, fanning out to three different central/southern departments (Midi-Pyré nées, Auvergne, and Languedoc-Roussillon). The best Laguioles should be made the original way, with Aubrac cows, but that's very hard to achieve now that other faster-milking (but lower milk protein-content) cows have been introduced to the region. As an aged cheese, it's hard and crumbly, but still a little creamier than something like a parmesan. And the cheeses are enormous -- 40cm diameter and almost the same in height. That's about a cubic foot of edible cow farm. 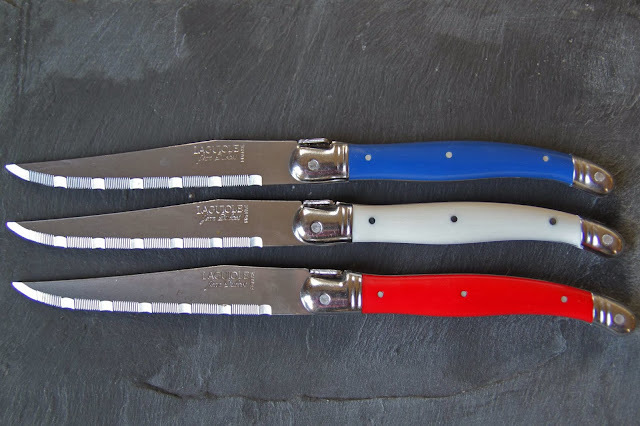 It's all in the name: Laguiole knives, Laguiole cheese. All of it from the same region, centered around the village of Laguiole. And all of it pronounced La-yole.